Tubular, green-yellow, fairly showy, up to 2.5cm long. 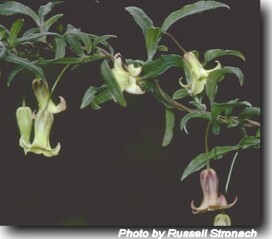 Slender undershrub with stems twining, to vigorous open climber. Quite common , climbing in the shrubby understorey of all but the driest forest communities. If planting in the home garden support on trellis or dead branch/shrub as this plant will eventually strangle and kill its supportive "host'. Not suitable below powerlines. Seed germinates much better after stratifying @ 4o C for 6-8 weeks. Remove the seed from the fruit and wash in detergent to clean. Generally germinates in the second year after sowing. Use of soil from under the parent plant may improve results.